When Saddam Hussein was captured in 2003 by U.S. forces, Iraq War advocates boastfully celebrated the event as proof that they were right and used it to mock war opponents (Joe Lieberman and John Kerry, for instance, gleefully exploited the event to demand that Howard Dean admit his war opposition was wrong). When Muammar Gaddafi was forced by NATO bombing in August, 2011 to flee Tripoli, advocates of U.S. intervention played the same game (ThinkProgress gleefully exploited the occasion to try to shame those who objected to the illegality of Obama's waging the war even after Congress voted against its authorization: as though Gadaffi's fleeing could render legal Obama's plainly illegal intervention). Once Gadaffi was brutally killed by a mob, advocates of intervention threw a giddy party for themselves, celebrating their own rightness and righteousness and declaring Libya a model for future western interventions. Upon Gadaffi's fleeing, The New York Times, which editorially supported the war, published a front-page article declaring: "U.S. 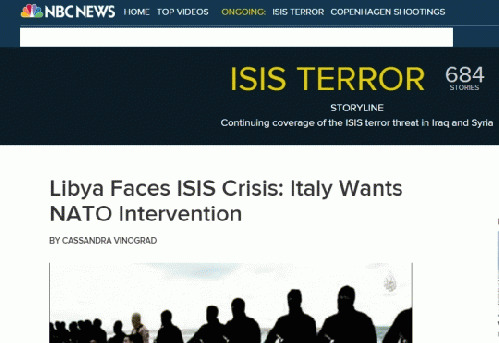 Tactics in Libya May be a Model for Other Efforts." 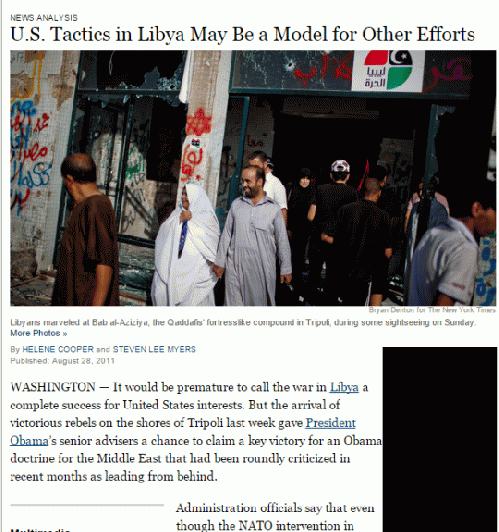 While acknowledging that "it would be premature to call the war in Libya a complete success for United States interests," the paper noted that events had given "Obama's senior advisers a chance to claim a key victory for an Obama doctrine for the Middle East that had been roundly criticized in recent months as leading from behind." Leading war advocates such as Anne-Marie Slaughter and Nick Kristof celebrated themselves as humanitarian visionaries and chided war opponents for being blinkered and overly cynical about the virtues of American force. British and French leaders descended upon Libya to strut around like some sort of conquering heroes, while American and Canadian officials held pompous war victory ceremonies. Hillary Clinton was downright sociopathic, gloating and cackling in an interview when told about Gadaffi's death by mob: "We came, we saw, he died." Democratic partisans were drowning in similar bravado ("Unlike the all-hat-no-cattle types we are increasingly seeing over there, [Obama] may take his time, but he does seem to get his man").